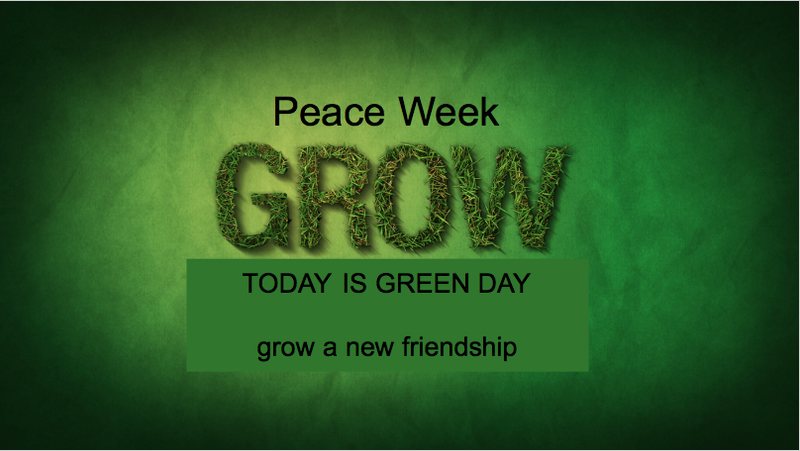 Monday Kicks Off Peace Week With Green Day: Grow A New Friendship! It’s time to kick off Peace Week at Mills Lawn! Peace Week is the beginning of a spring full of Project Peace 2.0 special projects throughout the school. Monday is Green Day where everyone is encouraged to “Grow A Friendship” by reaching out to someone with kindness and unity. We’ll participate in another Mix It Up Day where everyone has the opportunity to sit next to someone they never sit with during lunch. Get to know someone you don’t usually spend time with by asking them about their favorite food, music, hobby, or superhero! Discover what you might have in common and come to appreciate that we can all find meaningful ways to relate to others. Grow in your capacity to reach out and build new friendships! ← Animating Words for Peace!